Register for our forthcoming events here. 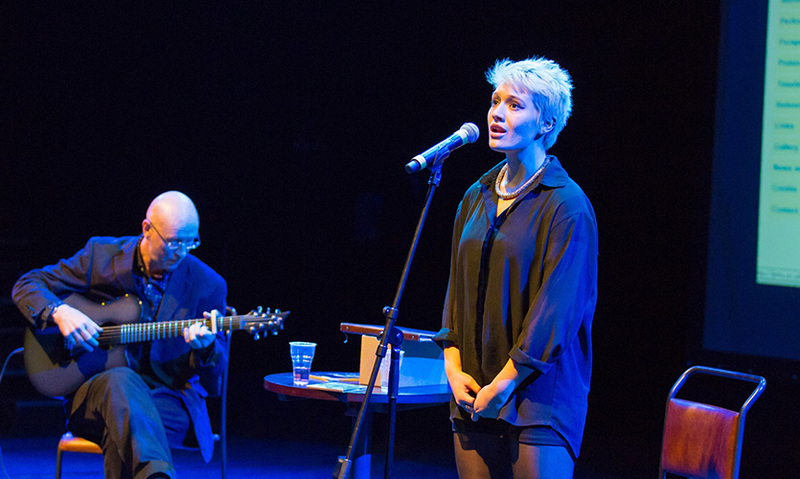 The MA in Musical Theatre at LJMU has been designed for actors, directors, choreographers, MDs, composers, lyricists, librettists and teachers. ​At the heart of the programme's work is an exploration of craft in creative processes and a belief that rigorous critical enquiry and best creative practice are inextricably linked. It aims to champion new work and new ways of working, and celebrates the unique expressive opportunities and appeal of the musical. ​With a unique ideology and appeal, the degree embraces not only the commercial musical theatre of Broadway and the West End but more experimental work, alongside other recognised forms such as cabaret, burlesque, melodrama, drag, and pantomime. The degree also provides a specific focus for the study of the British musical and its artists. During your studies you will learn to apply knowledge and understanding with originality and creativity for the re-interpretation of received assumptions regarding musical theatre performance. You will also gain the confidence to work creatively, collaboratively and collectively with musical theatre makers who possess varying levels of experience and styles. ​To develop your own creative practice as a musical theatre artist, you will learn how to effectively and appropriately employ a range of research methodologies and critical perspectives, including the ability to interrogate, evaluate and explore Musical Theatre ‘texts’ and processes. For students who wish to develop an entrepreneurial approach and set up their own theatre company, this MA will enable you to explore performance and event creation utilising organisational and managerial skills and industry knowledge. There are many ways to fund postgraduate study for home and international students. From loans to International Scholarships and subject-specific funding, you’ll find all of the information you need on our specialist postgraduate funding pages. LJMU has an excellent employability record with 96% (HESA 2017) of our postgraduates in work or further study six months after graduation. Our applied learning techniques and strong industry connections ensure our students are fully prepared for the workplace on graduation and understand how to apply their knowledge in a real world context. This programme is aimed largely at applicants who consider themselves ‘musical theatre artists’, whatever the context of their activities – professional, amateur, or educational. ​It will have an appeal for librettists, lyricists, composers, directors, choreographers, musical directors, performers and teachers – though not exclusively so; anyone involved in and interested in getting better at making musical theatre (as well as meeting entry criteria, of course) is welcome to apply. ​In addition, for those with backgrounds in composition, orchestration, playwriting, poetry, etc, it is an opportunity to apply those skills to the specific demands of the musical theatre’s dramatic and theatrical imperatives. For directors, choreographers and musical directors who have experience across their specific disciplines, the course provides the opportunity to hone more general techniques to the specific demands of the genre, acquiring new languages and processes in developing effective practice. Discover life as a postgraduate student at LJMU. This module will enable you to design, undertake, analyse and evaluate a significant piece of independent creative practice-as-research, in an advanced critical framework. Following a full-time, highly intensive induction week, the delivery of the programme is designed to give opportunities for those with other personal or professional commitments to structure full-time study in terms of their own time management. Full group attendance is required for only one whole day a week (at present Fridays 9.30am – 6pm) in Semesters One and Two, although most students find it advantageous to allow two days per week (Thursday and/or Saturday added to the Friday classes) in which to be regularly on-site for tutorials or small group working. When project work kicks in, however, students may well find it advantageous to be on site much more frequently for group rehearsal purposes. However, with good planning and available transport, students are able to undertake this course without moving to Liverpool. basis which constitutes the activities of a very busy full-time MA programme of study. Following the end of Semester Two (late May/early June) students present a mini-Festival of work and conclude their year-long Dissertation and Project Module by the end of August as the culmination of the programme. Practical work assessment is negotiated and agreed in a Learning Contract with tutors and will be appropriate to your specific discipline. Your ongoing progress will be fed back to you via regular one-to-ones with course tutors and other formative assessment in class and rehearsal. To cater for the wide-ranging content of our courses and the varied learning preferences of our students, we offer a range of assessment methods on each programme. Assessment techniques vary from module to module to reflect relevant assessment approaches and the key learning points of each topic. Assessments on this programme are a mixture of practical work, including performance, and written work, giving you the opportunity to demonstrate the required level of learning and achievement. Awarded the first UK PhD (Hull University) in modern Musical Theatre in 1990, Nick has been Head of Acting at both the Central School of Speech & Drama, and LIPA, before joining LJMU to introduce the MA in Musical Theatre and subsequently take on the role of Programme Leader of all Drama provision. He is an award-winning actor, composer/lyricist/librettist and director and is currently creating the follow-up to his 2014/15 autobiographical cabaret show Ecce Homo (Commissioned by Homotopia). 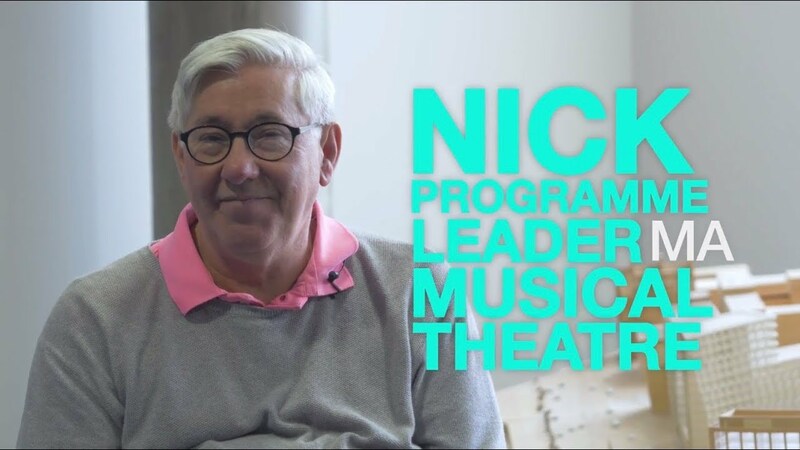 Nick has written a dozen musicals, several stage plays and adaptations, original cabarets for himself and others, several pantomimes, a chamber opera, and his Red Ribbon Requiem for soloists, choir and orchestra, as premiered by the Royal Liverpool Philharmoinic Orchestra and Chorus. His early professional life was as Naughty Nickers with gay clown troupe Bloolips, with whom he received a NY Obie Award in 1981. 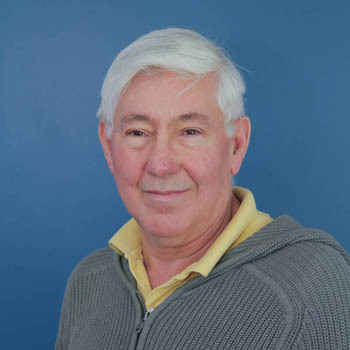 Nick has delivered papers at Conferences on Musical Theatre In Education (A new approach to inter-disciplinary training), Sondheim (love among the radio mics – the reinvention of the love duet), and at the international Song Stage and Screen conference (The Diva and the four Ds) and has a book in preparation. This course is ideal for anyone who has a passion for musical theatre in all its forms (cabaret, pantomime, burlesque, melodrama and many more) and who seeks to enhance their knowledge of their craft, whatever area that may be in, in the context of advanced critical thinking. It aims to provide a year of adventure in musical theatre. The Drama department has three dedicated buildings for its wide range of performances, workshops and classes: the Joe H Makin Drama Centre which houses rehearsal rooms, workshops, a 90 seat studio theatre and two smaller studio performance spaces; the John Foster Drama Studio, a large multi-arrangement theatre space, newly refurbished to enhance backstage provision and public areas as well as technical specifications; and the adjacent Modular Building which houses classes/tutorials, the department’s wardrobe, Drama staff offices, and where postgraduate students have their own small common room alongside dedicated study rooms/practical studios. All three are designed to offer space and creative freedom to students studying on one of LJMU's many drama undergraduate and postgraduate programmes. The buildings regularly play host to in-house student drama festivals, practical assessments, classes, visiting workshops and much more as part of the overall busy programme of events. The Redmonds Building, a five minute walk from the Drama facilities, contains broadcast studios, news rooms and media production suites. You will also have access to high quality lecture theatres and seminar rooms, social spaces, and the ground floor Starbucks cafe. All the above buildings are conveniently close to LJMU’s Aldham Robarts Library, which contains all the resources you will require for your studies, and is open 24-hours a day, seven days a week. Please note: All international qualifications are subject to a qualification equivalency check via NARIC. Contact LJMU's International Admissions Team for guidance on visa information. Further information is also available from our international web pages. You will apply for the majority of postgraduate courses using our online application form. You should complete the form thoroughly and provide a detailed personal statement which reflects your suitability and aptitude for the programme. All applicants will be called for interview in person or, where not possible, via Skype/Facetime. b) For directors, MDs and choreographers - recorded evidence of your work (preferably on USB stick or your own tablet/laptop) where possible, along with any further documentary evidence of your experience, including a list of productions and/or programmes, designs, etc. 1. Librettists - synopses or outlines of two shows either written or in development, with at least one scene in script form from both and at least one of these to lead into song/dance. 2. Lyricists - at least two full songs, preferably of contrasting style, and preferably in both notated form (script) and recorded (audio or video) in rehearsal/performance. These can be recordings made especially for this presentation. preferably both notated (piano/vocal score) and recorded (audio or video) in rehearsal/performance. These can be recordings made especially for this presentation. d) For producers or educators, any documentary or recorded evidence of at least two projects undertaken. In addition, all candidates should bring along a theatre CV outlining their relevant musical theatre and/or other performance experience in any capacity or role. Any other supporting material is also welcome. In the interview, we will ask you to articulate not only your background and interest in musical theatre but also the reasons why you wish to undertake this course and what you hope to get out of it. You will also be expected to demonstrate your ability to articulate ideas and critique of musical theatre at a level appropriate to Masters study. Where possible, this assessment will take the form of a group seminar discussion. The interview will be held with at least two members of staff, normally the Programme Leader and one of the delivery team. In the event of any query regarding preparation, please do not hesitate to contact the Programme Leader n.l.phillips@ljmu.ac.uk for further clarification. The University reserves the right to withdraw or make alterations to a course and facilities if necessary; this may be because such changes are deemed to be beneficial to students, are minor in nature and unlikely to impact negatively upon students or become necessary due to circumstances beyond the control of the University. Where this does happen, the University operates a policy of consultation, advice and support to all enrolled students affected by the proposed change to their course or module. Further information on the terms and conditions of any offer made, our admissions policy and the complaints and appeals process.